How many days of the week do you go to bed and get up at the same time? Or does your bedtime vary wildly from one day to the next? If you have responsibilities such as caring for young children or work shifts, it’s not always easy to keep to a stable sleep routine. And let’s face it, life would be boring if we never stayed up a bit later on the weekend! If you’re not the world’s best sleeper though, it’s helpful to stick to a consistent sleep pattern as much as possible. But even when you know that, it can seem difficult to get it under control. So in this article, you’ll find two ways to adjust your sleep schedule if it’s currently not working for you. The key concept is to set your alarm for the same time every day, and get out of bed at a regular time too. It’s hard to control exactly when you fall asleep, but controlling when you wake up is more achievable. Go to bed at 10 p.m. and read for half an hour (if you enjoy reading). Turn the lights off at 10:30 p.m. and fall asleep soon after. Wake up at 7 a.m. and get up soon after. 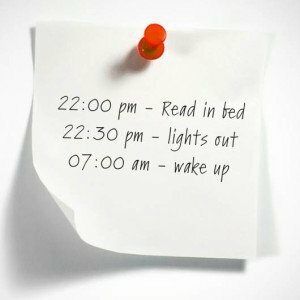 The time you go to bed, read for and set the alarm can all be controlled. The unpredictable part is actually falling asleep. So the secret is to try and be consistent in the timings of the things you can control. The idea is that eventually you’ll also start falling asleep at a more regular time. If your current sleep pattern is very different from your ideal one, then it may be better to work towards it slowly. Adjust your timings by 15 to 30 minutes per night over a week or two until you hit your target schedule. The most important point though is that you try to wake up at the same time as often as possible. One caveat is that if you really have a terrible night’s sleep, you might need to catch up if possible rather than soldiering on through the day on 2 hours’ sleep! You may find that you’re just not sleepy when it’s your scheduled bedtime. Or worse still, you try to go to sleep but find yourself wide awake. If you don’t like reading in bed, this may be the best option for you. Otherwise, you might become frustrated by all the time lying awake in bed. Even if your schedule says 30 minutes of reading, it’s fine to continue until you feel sleepy enough to drift off. Doing relaxation exercises in bed can help calm your mind and body. It also helps by distracting your brain from any worries or stressful thoughts. It takes 20 to 30 minutes for most people to fall asleep. So if you’re still awake after this time, get up and go into another room for a short while and try again later. The important point is to avoid lying awake for too long, worrying about falling asleep or how tired you’ll be tomorrow. If you have to, you can go back a step and repeat part of your relaxing bedtime routine if you have one. Sleep restriction therapy is about maximizing the amount of time you spend in bed asleep compared to how much time you lie awake for. It’s usually undertaken during Cognitive Behavioural Therapy under the guidance of a therapist. Below I’ll describe how it works, but before trying it, I recommend discussing it with your doctor and doing more research into how it works. The total hours you’re physically in bed for each night (not including reading time). 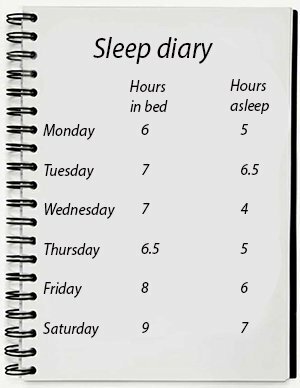 The total hours you think you were actually asleep, as best you can work out (it can be helpful to use a sleep tracker for this part). After 2 weeks, you then calculate the average amount of time you’re actually asleep each night. The next step involves only being in bed for the amount of time you’re sleeping for – even if it’s not the amount of time you’d like to sleep for (that comes in step 4). Let’s imagine that you slept for 6 hours per night on average during the two weeks. Perhaps you were actually in bed for 7.5 hours though, spending 1.5 frustrating hours trying to fall asleep. So now you know you sleep for 6 hours, you need to decide on a regular time to wake up and work backward from there. Let’s say that you want to wake up every day at 8 a.m. to get ready and go to work. 6 hours before that time means that your bedtime is going to be 2 a.m. initially. You should aim to be asleep for 90 percent of that time in bed. So if you’re going to bed at 2 a.m. and falling asleep by 2:15 a.m., you’re doing well. In reality, it might take a few days to adjust to this time, and that’s quite normal. Remember this is just the first step, so even though it might sound unusual, you will eventually go to bed earlier. When you’re able to sleep for 90% of your time in bed successfully for 2 days in a row, you can add 15 minutes more to the time you’re in bed. So using the same example, the next night you would be in bed at 1:45 a.m.
You may find it takes a few days to achieve that 90% sleep time, and that’s fine. Just keep trying and eventually your body should adjust to the schedule. You should have in your mind a target amount of sleep that you feel you need to feel refreshed and at your best. That might be 8 hours, for example, meaning that the 6 hours you were sleeping for on average clearly isn’t enough. So now you can slowly start working up to that time. Each time you start to fall asleep easily with the new 15 minutes increase, you can add another 15 minutes the next night. Eventually you’ll add enough 15 minutes to have reached your target amount of sleep. Some people may find they only need to add 15 minutes a couple of times to reach their target amount of sleep. 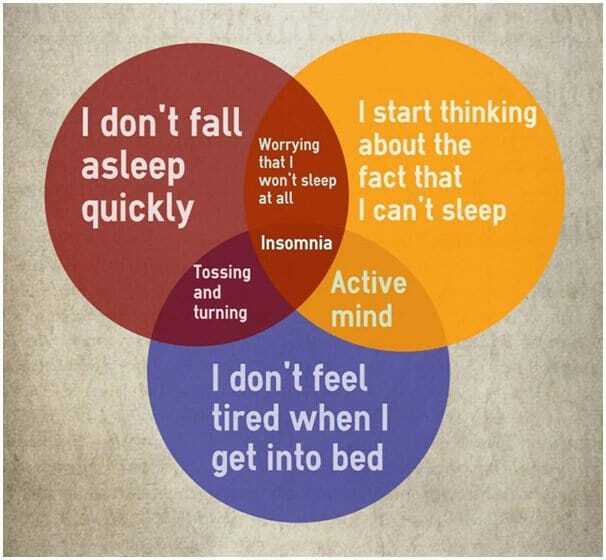 Others who have severe insomnia may find they need many steps. It all depends on how many hours you need, and how many you’re currently getting. Whilst you’re doing sleep restriction therapy, you need to avoid having a nap in the daytime, no matter how tired you feel. Don’t allow yourself any lie-ins either, even when you can’t sleep at night during the process. Once you’ve decided on your new regular sleep pattern, it’s also important to see it as a priority in your life. Your bedtime shouldn’t just be something you hope happens at the end of the day. You really need to keep to it and not allow other things to invade that time. If watching a film or your favorite TV episode, pause it and finish it tomorrow. If you’re catching up on some work, put it aside before the late evening. Finish it off in the morning. 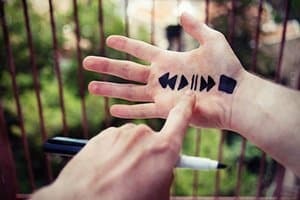 If playing video games, pause when you can. Don’t start any games you’re locked into and take hours to complete. In reality, we all know that social activities are also important to your overall well-being. But perhaps you could try to limit how often social events interrupt your schedule whilst you’re trying to get it back in line. If you live alone, developing a good sleep schedule and sticking to it is entirely under your control. But if you live with family or friends it may be a little harder to implement. Talk to your family or friends to let them know this is something you need to do to overcome your sleeping problems. Ask for their understanding and support. Is your partner keeping you awake? Sometimes the thing keeping you from falling asleep may seem out of your control, perhaps even your partner. There are many ways a partner can disturb your sleep: their temperature, snoring, teeth grinding, fidgeting, sleep talking, hugging you in an uncomfortable way or taking up too much space, to name just a few. Sometimes they may not even be aware how much of an effect they’re having. If snoring doesn’t keep them awake, then why would they need to do something about it? So talk to your partner openly and honestly about this. Preferably at a suitable time in the day rather than in a grumpy moment at 3 a.m.
You can phrase it in a positive way so that you make them feel they can help you and that you’re working on it together. This is much better than just accusing them of being the main reason you can’t fall asleep at night. They may also need to be willing to talk to a medical professional or take self-help action themselves. If they snore loudly, for example, it’s worth talking to their doctor to check there isn’t something more serious behind it such as sleep apnea. Finally, you might even like to consider sleeping in separate beds. A surprisingly large number of couples do this, and it can be very beneficial for your sleep. Many people fall asleep with no problem, but then wake up in the middle of the night. It can be quite upsetting to be awake at 3 a.m. – time seems to go so very slowly at that hour. But you may be surprised to hear that there’s scientific and historical evidence to suggest that this isn’t actually harmful, and for some people it could even be beneficial. Medical professionals usually call this sleep maintenance insomnia. But there are other theories suggesting that you can make good use of the time. What’s your sleep schedule like at the moment? Which ideas in this article do you think would be most useful? Let me known in the comments. Insomnia is new for me. I used to be able to drop off in a few minutes…but recently I have had trouble going to sleep. At first it was just a day here and there. But the last few days have been worse. I added melatonin, but that didn’t really help me sleep it just made my body lethargic while my mind kept thinking. Now I think I am in that vicious cycle of focusing on not sleeping. last night I didn’t sleep at all. I am going to try zzzquil. Two questions 1) how many consecutive days is it ok to use, 2) at what point do I have to see a doctor? Thanks for your comment. Yes, worrying about sleep can in itself cause sleep problems, annoyingly. It can help to do simple breathing and relaxation exercises to keep your mind focussed elsewhere. You can read my review of zzzquil for my thoughts on that sleep aid. Personally, I wouldn’t take it for more than 2 weeks. And they often say that if you have sleep problems you can’t fix for 2+ weeks, speak to a doctor. Hello…. I have a sleep problem thanks to my husband. He snores and also is a mouth breather… and he does it on my face. Keeps me awake besides other noises and talking while he sleeps, sometimes he wakes himself up with his noises… is so loud that scares me all the time. I tried to get help from a doctor but he doesn’t want to go to see him. Luckily I’m not working now and our kid is on holiday now. But I need to find a solution… ! Thanks for your comment, and sorry to hear you’re having difficulty with sleep. If he snores loudly and sometimes wakes himself up, I think it’s important that he gets tested for sleep apnea. Perhaps if you do some research into that and talk to him about the risks apnea presents, he might be more inclined to take it seriously. I also suggest looking at my article about sleeping with a snorer – you might find some useful tips there! I work weekend nights. I am required to be at work at 4 PM. Normally I get off work about 4 AM. By the time I get home, it’s usually after five AM, it could be as late as 6 AM. All I do is sleep and work. How do I get myself out of this rut? When I am not working, I struggle to go to bed before five or 6 AM. I do not even get out of bed before 2 PM on my days off. When I do, I am very sleepy. One problem is my wife’s clock is going off at 6:45 in the morning for her to get up and get ready to go to work. If I do go to bed just after I get home from work, I get woke back up in an hour, so normally I don’t even go to bed until her alarm clock goes off. I should also state for the record that I am on a CPAP machine. Thanks for your comment. I can empathize with you on this one, having worked shifts in the past. It’s never easy, and not for everyone. Personally, I ended up stopping the shift work because it was too difficult for me to sleep well. I wrote an article a while back giving advice for shift workers which you might find useful. Another possibility is to think about sleeping in separate bedrooms, if you have one available. 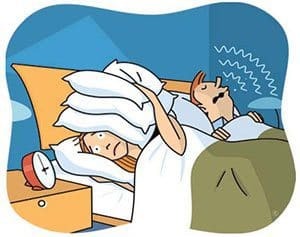 That way you can block out light, use earplugs or whatever you need if noise keeps you awake, and shut yourself away in the hours you need to sleep. But at the end of the day, if you’re really struggling and can’t adapt to the shifts, and it’s greatly reducing your quality of life and happiness, it might be a case of looking for alternative work if you’re able to. Thanks for your comment and for sharing your experience. It’s always great to hear someone’s sleep improved after reading an article, so thank your for your feedback. I hope your sleep continues to be better and your work life easier. I am having serious insomnia due to anxiety. Now I get some sleep initially, them I’m jolted awake. That continues to happen all night. I’m exhausted and delirious during the day. My doctor told me to take an over-the-counter sleep aid. I’m sure that will help, but doesn’t it just mask the problem? Can I take these meds and practice sleep hygiene simultaneously? Will that help me quit the medications? Thanks for your comment. You can do both things if you like. I think it’s good for anyone taking sleeping pills to try to phase them out and control the sleep insomnia naturally if they can. But if you’re really struggling and need something to help you sleep from time to time, that’s what the sleep aids are for. Thanks for your comment. Getting some good, restorative sleep again will very likely improve your memory if the lack of sleep was what led to the problem. I recently took a second job. My bedtime used to be at 10 PM, while I didn’t sleep through the night, (I wake up but fall back to sleep), I still got sleep. NOW I can’t get to sleep and I firmly believe it is because my bedtime routine is a mess. I am going to try, regardless of what time I get home, to make my bedtime 11:30 as I like to get at least 6 hours. Thanks for your comment and your kind words – it’s always good to know readers like the website. I think keeping a close eye on your sleep schedule is one of the best techniques for improving sleep, so hopefully your plan will work well. Sleep maintenance insomnia may be normal for some, but for me it’s detrimental. It makes me feel like I’ve been beaten. I can’t move or breathe, sometimes I lie there exhausted and breathless. It’s horrible. I just want to sleep striaght through. I feel best when I sleep all at once, not broken, or shortened. I end up sometimes not being able to even get up in the interim b/c I’m too sick and tired. I have chronic fatigue too. So for me sleep/rest is essential to feeling bad vs. feeling really bad. Thanks for your comment. I know, it’s not an easy one to deal with. Have you spoken to your doctor about all this, and how you feel breathless at night and fatigued during the day? Those to me sounds like symptoms to get checked out. Thank you so much for your useful tips, these are very handy! However, I am getting married in 7 weeks. Recently I have had some trouble sleeping at night. I am assuming this down to me feeling stressed or anxious about the wedding. Are there any tips or techniques you could recommend to de-stress before going to bed? 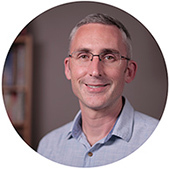 Thanks for your comment, it’s great to know you liked the tips. Congratulations first of all! I think this is a very common time to feel stressed and anxious, and yes there are plenty of techniques you can try. Did you see my article about relaxation techniques? There are some good methods in there, and also information about a more involved practice called mindfulness which I highly recommend. Thanks for your comment, and compliment. You’re right in that I don’t have a dedicated article about napping, or mention it in that many articles. I do have an article about sleeping in phases which you might find interesting though. The website is based in wordpress, but with a huge amount of extra coding done. Idk if it will work. But I can’t sleep in the night cause I’m not tired but when it reaches 6am I start to get tired and sleepy. Can you help me? Thanks for your comment. Have you thought about trying the sleep restriction therapy technique? It might feel a bit torturous at first, but in time could help you. It sounds like DSPD, delayed sleep phase disorder/syndrome. Many people are like this I also feel sleepy very late, around 4 am is my natural bedtime, but with my insomnia, it’s delayed even more, to the point where sometimes I can’t even get to sleep until after 8 am, which is horrible. I end up sleeping the entire work day away & can’t make important phone calls, or handle important business. I miss sleeping from 4 am to 12 pm. That’s what I’d love to get back to. But maybe you should try to accommodate your natural sleep cycle. See if you sleep OK, just at a different time. Oh &1 more thing, my BFF is a natural extreme night owl like me, her natural bedtime is around 6 am, that’s when she feels best, sleeping from 6 am – 2 pm. But now she’s on a day schedule. It took her years to be able to do it, she finds that in order to wake up rested, she needs to sleep longer, about 10 hours instead of only 8. Great article, I’m going to try all of it! Thx for sharing. Thanks for your comment and compliment. Let me know if it helps you sleep better! Awesome Article! My sleep schedule has been terrible for so long now. I will try and use your ideas and see if I can get back to how I used to sleep. Thanks! Thanks for your comment and I’m glad you found the article useful. I hope the techniques here help you get back on track. Stick with it, as it can be tough at first to get your sleep back in line. But it’s worth the perseverance in the end.